Astrophysicists have long hypothesized that the cycle exists based on calculations of celestial mechanics, but the authors of the new research have found the first verifiable physical evidence. They showed that the cycle has been stable for hundreds of millions of years, from before the rise of dinosaurs, and is still active today. The research may have implications not only for climate studies, but our understanding of the evolution of life on Earth, and the evolution of the Solar System. It appears this week in the Proceedings of the National Academy of Sciences. Scientists have for decades posited that Earth’s orbit around the sun goes from nearly circular to about 5 percent elliptical, and back again every 405,000 years. The shift is believed to result from a complex interplay with the gravitational influences of Venus and Jupiter, along with other bodies in the Solar System as they all whirl around the Sun like a set of gyrating hula-hoops, sometimes closer to one another, sometimes further. Astrophysicists believe the mathematical calculation of the cycle is reliable back to around 50 million years, but after that, the problem gets too complex, because too many shifting motions are at play. 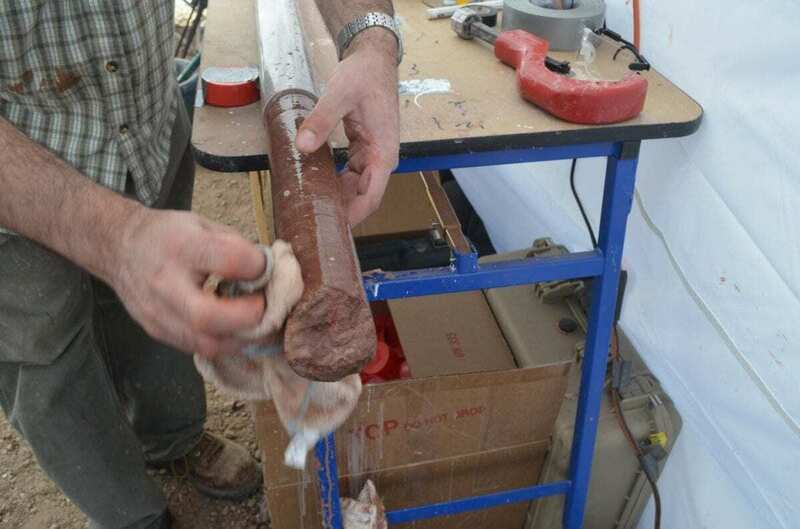 The new evidence lies within 1,500-foot-long cores of rock that Kent and his coauthors drilled from a butte in Arizona’s Petrified Forest National Park in 2013, plus earlier deep cores from suburban New York and New Jersey. The Arizona rocks in the study formed during the late Triassic, between 209 million and 215 million years ago, when the area was covered with meandering rivers that laid down sediments. Around this time, early dinosaurs started evolving. The scientists nailed down the Arizona rocks’ ages by analyzing interspersed volcanic ash layers containing radioisotopes that decay at a predictable rate. Within the sediments, they also detected repeated reversals in the polarity of the planet’s magnetic field. The team then compared these findings to the New York-New Jersey cores, which penetrated old lakebeds and soils that hold exquisitely preserved signs of alternating wet and dry periods during what was believed to be the same time. The planetary motions that spur climate swings are known as Milankovitch cycles, named for the Serbian mathematician who worked them out in the 1920s. Boiled down to simplest terms, they consist of a 100,000-year cycle in the eccentricity of Earth’s orbit, similar to the big 405,000-year swing; a 41,000-year cycle in the tilt of Earth’s axis relative to its orbit around the Sun; and a 21,000-year cycle caused by a wobble of the planet’s axis. Together, these shifts change the proportions of solar energy reaching the Northern Hemisphere, where most of the planet’s land is located, during different parts of the year. This in turn influences climate. In the 1970s, scientists showed that that Milankovitch cycles have driven repeated warming and cooling of the planet, and thus the waxing and waning of ice ages over the last few million years. But they are still arguing over inconsistencies in data over that period, and the cycles’ relationships to rising and falling levels of carbon dioxide, the other apparent master climate control. Understanding how this all worked in the more distant past is even harder. For one, the frequencies of the shorter cycles have almost certainly changed over time, but no one can say exactly by how much. For another, the cycles are all constantly proceeding against each other. Sometimes some are out of phase with others, and they tend to cancel each other out; at others, several may line up with each other to initiate sudden, drastic changes. Making the calculation of how they all might fit together gets harder the further back you go. Jupiter and Venus exert such strong influences because of size and proximity. Venus is the nearest planet to us–at its farthest, only about 162 million miles–and roughly similar in mass. Jupiter is much farther away, but is the Solar System’s largest planet, 2.5 times bigger than all others combined. Kent and Olsen say that because of all the competing factors at work, there is still much to learn. “This is truly complicated stuff,” said Olsen. “We are using basically the same kinds of math to send spaceships to Mars, and sure, that works. But once you start extending interplanetary motions back in time and tie that to cause and effect in climate, we can’t claim that we understand how it all works.” The metronomic beat of the 405,000-year cycle may eventually help researchers disentangle some of this, he said.